So we’ve reinvented the EC meter, or CF meter as we call it around here. When gardening hydroponically, you usually use an “EC Truncheon” to measure the concentration of nutrient salts in the hydroponic fluid. If you just pass a current through the liquid and see how much passes, you start to change the chemistry and your reading goes inaccurate very quickly. So these devices measure the conductivity in short pluses, swapping direction each time they make a measurement. The electronics, we thought, was an unnecessarily complex collection of op amps, comparators and other fancy bits. 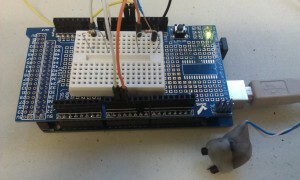 So we designed a way of making an Arduino do the hard work so you can build one into your own automated systems. Start by extracting the carbon rod from the centre of an AA zinc/carbon battery. Clean it, clean everything else, then boil the rod in water for a few minutes to get the last of the battery compounds out of it. Break into two pieces, notch the ends with a file, wrap and tightly twist a wire into each notch, then embed the whole thing in your favourite waterproof plastic leaving a couple of millimetres of each rod sticking out about 10mm apart. That’s your sensor. The wiring is easy: One electrode is wired to A0 on the Arduino, the other to A1. A 2K2 resistor (red, red, red bands) is used to connect D2 to A0, and another connects D3 and A1. That’s it. Load the code below into your Arduino and you’re off. Calibration is a bit tricky, and unless you have EC buffer solutions handy, you’ll want to borrow a real EC meter. We use CF units rather than EC units because they’re largish integers which both the Arduino and humans find easier to relate to. Run the code below and call up the Arduino serial monitor (under “Tools” in the IDE) to see the sensor values your setup is measuring. Dunk sensor in pure water to get the ‘baseValue’, and edit it in. The ‘cfTable’ consists of a series of [sensor reading,CF reading] pairs. 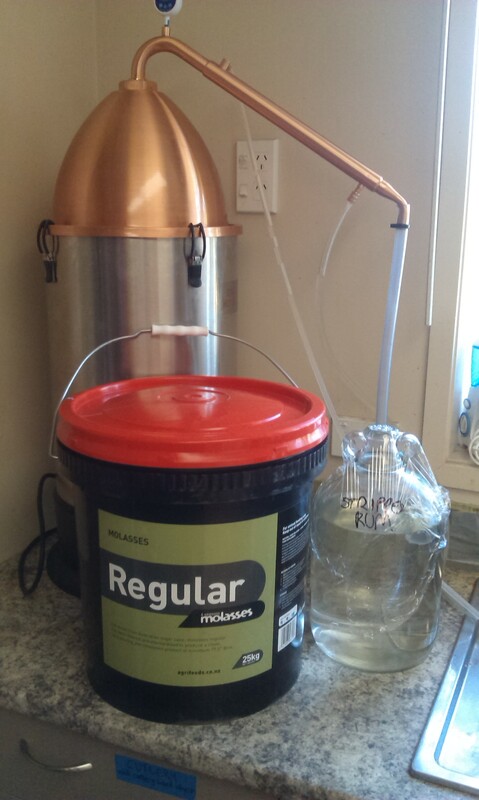 Mix up slightly salty water, measure it’s CF value with the real EC meter, and then test it with your homemade probe. Use a range of CF values as we have, and if you expand or reduce the table do remember to alter the TABLE_ENTRIES count. Feel free to hack the code to return more convenient data for your automation system, or use A0-A3 for the pins to simplify the wiring. The important thing is to remember to call the neutral() routine as soon as the measurements are done to turn off the sensor and prevent chemistry happening. It’s all GPL’d. Enjoy. CF Meter (or EC meter) for aqueous nutrient measurement. read so that electrolytic effects even out. // Stop the outputs from doing anything electrolytic. // Use the table to average out the sensor data and calculate the corresponding CF. // This may not be the best way, but it is the most legible! delay(2);  // Wait for the ADC to settle. // Now stop buggering around. Today I ha ve planted the next generation of beet which will take over from the current run which was planted in April and has provided us with 2 meals every week over the winter period. The plants are going strong but I am told that they are likely to go to seed soon. These are Kings Seeds “Beet Rainbow Lights”. I like the Kings Seeds best as the range of colours is more spectacular than I had in my previous big name pack. The cabbage shown there is ironically the “Space Saver” variety ( also from Kings) – ironic as this is the biggest cabbage I have ever grow. The beans went in mid August which is early even for Auckland. They are a little yellow, but I don’t think this is due to the weather, rather it is a result of the PH being high, which beans appear to be very sensitive too, a result of me losing my PH testing kit (now replaced). As I have this issue with the PH frequently in spring, but not any other time, I suspect it may have something to do with the broad beans. Hidden behind the beet is a run of tomatoes, chillies and basil that was also an early planting experiment. The tomatoes have done well and are about to take off. Some of the chillies have died, but that was a result I think of plumbing issues (now resolved). 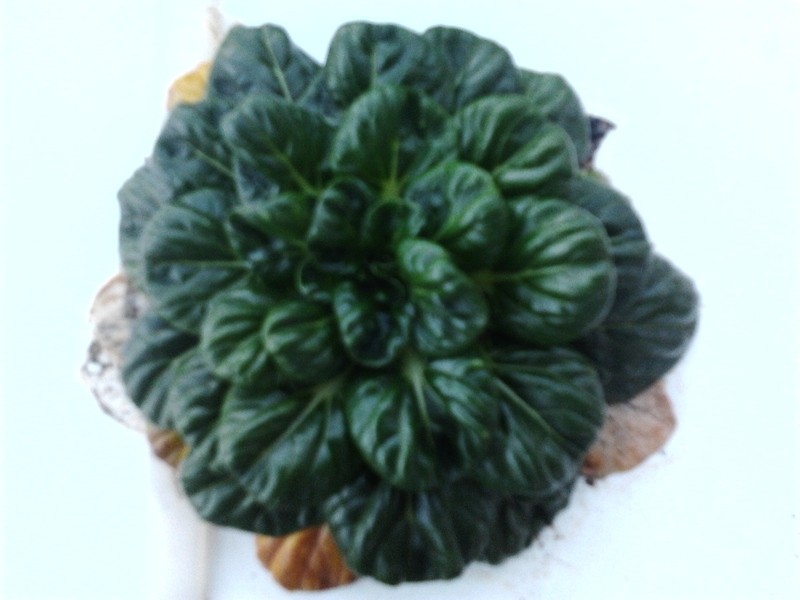 The basil hasn’t done much and is looking a little sorry. The celery is ready to be ripped out and eaten but has also done us well over winter. It’s only been in for 10 months, but the hydroponics system is now well established. 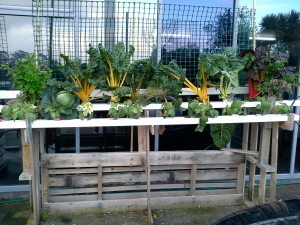 We have 12 runs in place – 6 x 3 metres and 6 x 2.5 metre NFT runs. A number of experiments have been run over winter, with varying degrees of success. Kohl Rabi was without a doubt a massive and unexpected success. All 8 plants put in produced good sized and sweet bulbs, most of which were eaten raw, but some we cooked and placed in stews. It was very good as a cabbage replacement in coleslaw. Two varieties of sprouting broccoli were grown Winter Rudolph and Tender Stems. Without a doubt the Winter Rudolph has been more prolific, but both really are too large for a hydroponic system. Broad Beans were overwintered and are now producing huge amounts of pods. Again the hydroponic version appears to be sweeter. Rainbow lights silverbeet has not only provided us with leafy greens all winter (we pick the leaves of the outside rather than harvesting the whole plant) but is very attractive. We found that the seeds from Kings Seeds gave a much better range of colours than those we have bought from other suppliers. Cauliflowers were mixed. Some produced good sized heads, others were no bigger than a sprouting broccoli head. I will try again next winter with different varieties and better documentation. Our one space saver cabbage that survived has produced an amazing head but the germination was poor and we lost a lot of plants to winter storms. 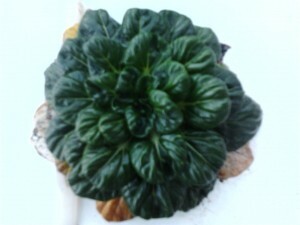 There were also a lot of choy grown which were plucked and eaten over the winter. There was certainly no risk of us going hungry. We’ve had a 1.2m x 1.2m CNC machine for a while, but it’s about to move in to its new home and be furnished with a backed-up 1600kVA power supply. The vacuum dust extractor unit on its own takes nearly that much, so that won;t be backed up and it’ll be out with the handyvac to clear the sawdust if the power goes off. The slight problem with the move is that the CNC won’t fit in through the soundproof room’s door. So we’ve smacked a big hole in the wall with great gusto and will frame & conceal said hole with some very large pinboards. 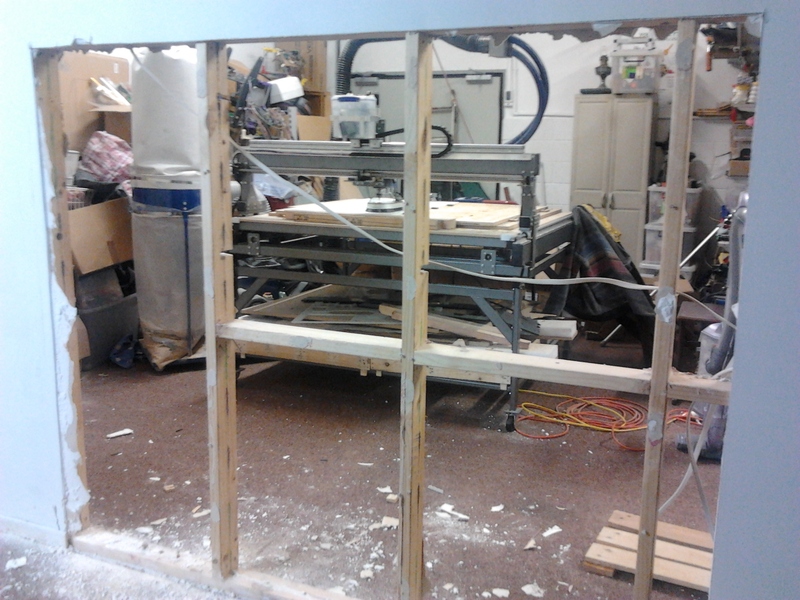 This will allow us to add more CNC machines to the soundproof room, and move them in and out for repair etc. 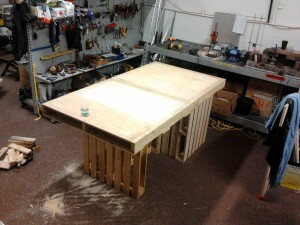 I made us a workbench from completely recycled materials. It took a few hours off my Sunday but was quite fun and I got to play with the selection of pry bars that the kids got me for father’s day. I stacked 3 palettes in a U formation for one end of the base, and put an upside-down T of two palettes “underneath” to form the base. The palettes were screwed together with 32mm #8 square-head screws – I’m starting to like square-head screws as they’re easy to extract and recycle as well as drive in. Two plywood-surfaced palettes make the top. 4 Crossbeams from other palettes were slipped into the butting ends of these and bolted into place: Two alongside the central crossbeam, one at each of the side beams. I even used recycled bolts from heavy-duty palettes. The top is then held on the bottom with screws wherever the palettes happen to align nicely. It’s quite sturdy, and I can bounce up and down on it like a demented thing without it wobbling about. It has now acquired a vice and removable cutting area, and is in actual use. It does rock a bit when you saw something in the vice, but it is sitting on some much abused carpet. We moved in, and chaos reigned. We couldn’t sell the house, which drained our farm finances away. Yesterday, the house sale fully completed and we’re contemplating the future of the farm once more. It will go ahead, but slightly delayed while we pump the finances up again. Not an entirely bad thing – we’ve been learning a lot in the interim. 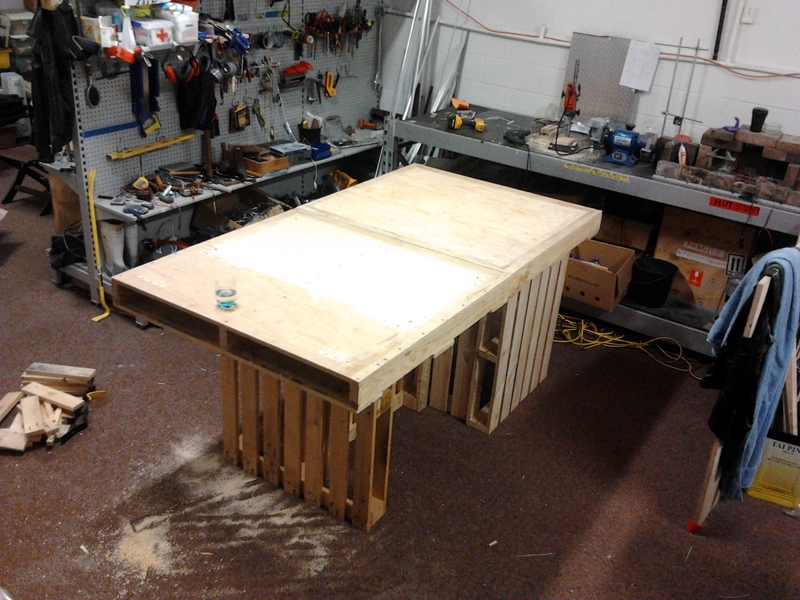 First project is going to be a hydroponics system for the industrial unit. We set up a small solar hydroponics system in the front yard when we moved in, and that has worked well. Having observed that the sun strikes those big, reflective windows first thing in the morning, we’ve decided to erect a system there using a more powerful pump and potentially extending the length of the front of the building. Given the hail we’ve had recently, some form of covering also seems prudent. Our tatsoi (above) and similar winter fodder don’t mind the weather, but cosseted early veg are more fussy! 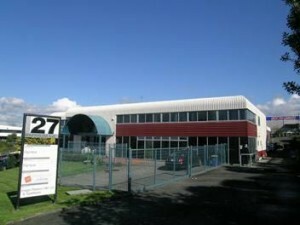 The process of developing Geeko Farm continues with the acquisition of industrial premises in Waipareira Ave. in Henderson, not far from where Suz went to school all those years ago. We now have 420m2 of office, warehouse, workshop and living quarters in which to run our 3D Printer filament business and house the technological and social development necessary for the Farm. Ladies and Gentlemen, we are on the move. It appears we’ll need a small industrial base to get our farm started. This will be done in an industrial unit which we can live over during the transition from big house to farm. As our main business grows, it’ll take over the unit entirely and we move into the farm. Neat eh? The irony of moving into an industrial unit in order to run an environmentally friendly farm is not entirely lost on us, however we are developing bioplastic from non-fossil sources and promoting shareable technology so it’s not a bad thing – as long as I can stand living away from greenery for a little while. I’m keen on trying beer, ale, cider and mead crossmixes. So as a prelude to becoming a fleshy cocktail shaker I have had to stoop low enough to buy an extract beer kit. Why would I do such a thing as opposed to making real beer? Well, because you get the same bland beer each time so it’ll be easier to tell what basic changes are wrought by the addition of, say, honey. Daughter Kate is a microbiology student, so she can aid the experiment. Students are good at drinking. Actual work remains completely frantic. The first items for our upcoming Geekotech store have arrived, so more frantic web site dickering is needed while simultaneously handling a new batch of PLA and catching up on the Easter holiday backlog.